Teen sensation Kelly Sildaru repeats as X Games ski slopestyle champion, youngest with 2 golds. From the Baltic Sea harbor city of Tallinn, she has become a legend in Estonia and there is an Estonian media contingent who have followed her to Aspen. 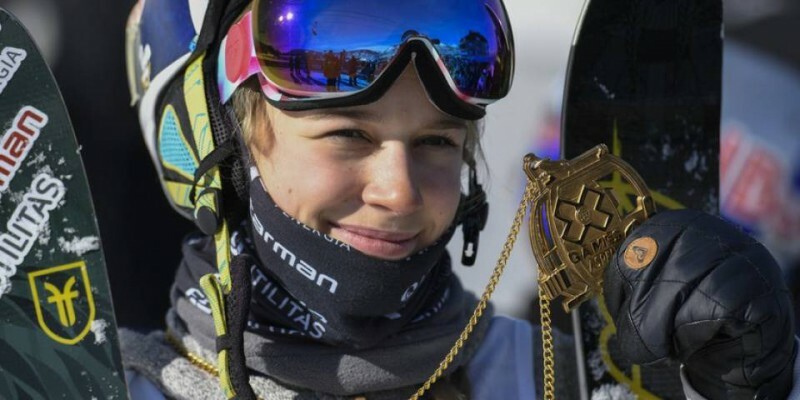 The 14-year-old from Estonia became the first X Games athlete younger than 15 to win two gold medals when she returned to the top of the slopestyle podium at Buttermilk Mountain. Knowing she had the gold Sunday before her final run, Sildaru still tried to top her first-run 92.33-point score, which held up for gold and led a teen sweep. She bounced smoothly through the rail section at the top, then dialed up the spins on the bottom of the course with a rightside 720, a leftside 900 landing backward then finishing with a switch leftside 1080. The 14-year-old from Estonia is the first female skier and youngest athlete to win two medals at one venue; Sildaru won silver Saturday night in the big air event. Sildaru, whose birthday is Feb. 17, is the second woman to win two medals this week, joining snowboarder Julia Marino (gold in slope, bronze in big air). The last time a woman won two medals in an X Games weekend was 2000. France’s Tess Ledeux, at 15 the second youngest on start list behind Sildaru, won silver as an X Game rookie. Norway’s Johanne Killi, 19, repeated as the bronze medalist with a final 85.66-point run, knocking off 18-year-old Giulia Tunno of Switzerland, who won bronze Saturday in big air.